Back in 1941, Nazi U-Boats infiltrated the Chesapeake Bay. Local lives were lost defending the town of River Sunday – but was a traitor involved? Now, grandson John Thornton risks his life to uncover the truth. The town was now run by powerful businessmen who had no interest in the past. He worked hard to uncover the traitor and found the ruins of an old Nazi Bund campground with the help of a feisty archeologist, Clarissa Pebbles. When an attempt was made on his life, he knew he was getting closer. Then an amazing discovery opens up clues to a deadly Nazi plan that could have changed America forever. It’s a mystery told within the shadows of World War Two and the hunt for long hidden war criminals. Add the natural beauty of the Eastern Shore of Maryland with its traditions and legends of good and evil. Thomas Hollyday has had much critical success with his Chesapeake fiction and non-fiction. Enjoy War Boat, his new, fascinating and well-researched page turner for your reading pleasure. Thomas Hollyday (1942-present) was born in Easton, Maryland. His father was an acclaimed photographer and his mother a brilliant teacher.His father’s family were active in the history of Maryland since its settlement while his mother’s family were prominent in Democratic Party politics. His grandmother’s family descended from a well known German industrial family of Baltimore. He grew up in the southern atmosphere of the Eastern Shore with its maritime and military heritage. He studied writing with Elliott Coleman at the prestigious Johns Hopkins Writing Seminars and with C.Michael Curtis of the Atlantic Monthly. He served with distinction in Vietnam and became a successful international businessman.He also drew illustrations for national magazines and published maritime and Civil War history. He currently edits popular video blogs on you tube for animal water rights and for book reviews. He draws the popular humorous Animal Viewpoint Cartoons for newspapers. 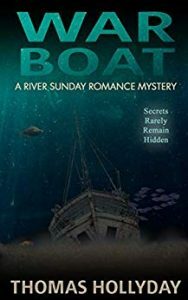 He continues to please his fans with new novels in his River Sunday Romance Mysteries collection. In his fiction he describes his recurring theme that human settlers since prehistoric times in the Chesapeake region have left a mist of legend and history that permeates its modern stories with a certain compelling truth. At the same time he incorporates the stories of machines with those of their human owners. Each novel, located in the small town of River Sunday, Maryland, also records the continuing beautiful nature of the area. His writing portrays today’s problems, conflicts, and memorable local characters with their loves and their combat with evil.